The idea of the possibility of recovering sounds from before the era of recordings is fascinating, even spellbinding. But it will not do much good left floating around as a dream of what might be possible. Therefore, I set about making a player that should be able to play any surface that has been formed by an acoustic wave. It was not very hard, the world is full of electronics these days. I took a pickup on a tone arm and connected it to a portable amplifier. 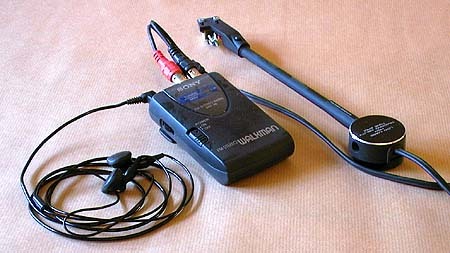 This amplifier is really a Walkman radio with the tuning part removed and only the amplifier still in place. All I had to do to convert it was to find the tuning part, incapacitate it to get rid of any sound from radio broadcasts, and find out where to solder the wires from the pickup to get the necessary amplification. The sound is fed to a pair of earphones and comes through loud and clear - and in stereo, which I imagine would make it easier to make out any sound under the crackling of an uneven surface. So far I have not been able to make out any sound from any surface other than records, and it seems I will have problems finding anyone willing to let me expose their old paintings to the risk of scratches from the stylus. For, if this project is to make any sense, the sound carrying surface would have to be older than 110 years or so. The player is now on loan to Professor Paul Åström. Let's see what success he may have. Join in the discussion: But do I really believe it will work?